Farm volunteers support daily farm activities, participate in community projects and are an integral part of the team. 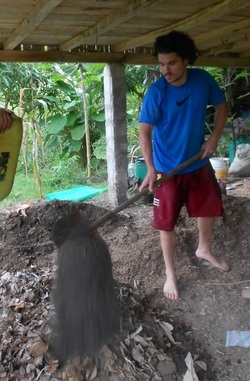 Volunteers come from all over the world to experience life on the farm, learn about permaculture and tropical agriculture and support a young project where their contribution is felt! Please include information about yourself, why you are interested in Finca Mono Verde and tentative dates. "Finca Mono Verde was a phenomenal field experience to introduce me to a little part of what agricultural development can look like on the ground"
GROW Interns have the unique opportunity to develop an individual project for implementation on the farm. Interns complete a project plan with support from the Finca Mono Verde team before going to the farm based on their interests and the current needs of the farm and community. Past projects include a chicken tractor, cob oven, composting toilet, and irrigation system improvements. Upon completion interns are asked to write a summary of their experience and submit it with photos to the team. See the complete description for more details. The contribution covers room and board while on the farm as well as support developing a project plan, related research and follow up after the time on the farm is complete. Interns are responsible for their travel to and from the farm and any adventures they may have away from the farm. The start date and duration are based on individual availability and project scope. Please send your resume and a brief email explaining your relevant interests, experiences and background, your preferred timeline and Spanish skills. Interns do not have to currently be enrolled in university or post-graduate programs to apply. For large groups costs are negotiable and are based on group size, duration of the stay and activities planned in collaboration with the Finca Mono Verde team. We are interested in hosting global citizenship groups, gap year students and study abroad program participants and design group trips on a case by case basis depending on availability, program focus and individual interests.